The Seagate Backup Plus portable drive simplifies backup for those who want to help protect their entire digital life locally, in the cloud or from their mobile devices and social networks. The slim, metal design providespremium portability - allowing you to slide the drive into your pocket, purse or backpack and carry it with you. High-speed USB 3.0 and 2.0 connectivity offers plug-and-play functionality on your PC without the need of an external power supply. Plus, install the provided NTFS driver for Mac and you can use your Backup Plus drive interchangeably between Windows and Mac computers without reformatting. Via the Seagate Dashboard software, you are provided with tools for local, mobile, cloud and social media backup. Run a one-click backup or schedule an automatic backup plan to protect your files in your Backup Plus portable drive at your convenience. Install the free Seagate Mobile Backup app on an iOS or Android mobile device to back up all of the pictures and videos fromthe device to your external drive or the cloud. Thanks Wrecker. Was looking for a 4TB today as well. This or the Maxtor? I've just posted the maxtor as well . Depends, what you using it for? Will be using it as a NAS drive for my movies/TV shows. I was going to ask if Maxtor is any more reliable than Seagate but a Google search reveals that Maxtor is now owned by Seagate! Will be using it as a NAS drive for my movies/TV shows.I was going to ask …Will be using it as a NAS drive for my movies/TV shows.I was going to ask if Maxtor is any more reliable than Seagate but a Google search reveals that Maxtor is now owned by Seagate! Although they are now owned by them, they wont have retooled and be making drives as Seagate make them; for many years Seagate have had a strange manufacturing method, and their drives can sometime fail advanced tests that other makes pass with ease, yet still be "perfect" according to Seagate quality control. I am not sure if this is still true, although I did see the exact same test fails on an almost new 1TB drive about 3 years ago. WD have had a slew of unreliable models over the last 18 months; this does happen, even Hitachi and Toshiba, the most reliable brands; have suffered with unexpected high failure rates on new technology drives; this is why I wait a while, and dont race to buy the latest high cap drives; but settle for the previous generation. By the time I buy, the kinks have been sorted and they are generally much more reliable. would any know if this would work as an external hardrive for an xbox one please? would any know if this would work as an external hardrive for an xbox one …would any know if this would work as an external hardrive for an xbox one please? Maxtor transfer rate is 4.8x faster. 100mb/s vs 480mb/s. Maxtor has 3 year warranty. I expect they probably have the same seagate drive inside. Although they are now owned by them, they wont have retooled and be making …Although they are now owned by them, they wont have retooled and be making drives as Seagate make them; for many years Seagate have had a strange manufacturing method, and their drives can sometime fail advanced tests that other makes pass with ease, yet still be "perfect" according to Seagate quality control. I am not sure if this is still true, although I did see the exact same test fails on an almost new 1TB drive about 3 years ago.WD have had a slew of unreliable models over the last 18 months; this does happen, even Hitachi and Toshiba, the most reliable brands; have suffered with unexpected high failure rates on new technology drives; this is why I wait a while, and dont race to buy the latest high cap drives; but settle for the previous generation. By the time I buy, the kinks have been sorted and they are generally much more reliable. All true but seagate still make the worst drives and have the same consistent failure rates for all their drives bar their newest 8tb ones. 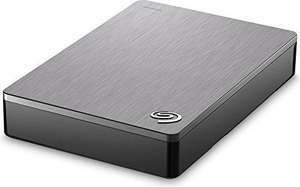 4tb basic seagate drive - no way! Might be true; the only way to know is to get one and use something like crystaldiskinfo to read the internal descriptions; this is how I know most Toshiba drives are actually Hitachi. All true but seagate still make the worst drives and have the same …All true but seagate still make the worst drives and have the same consistent failure rates for all their drives bar their newest 8tb ones. 4tb basic seagate drive - no way! Also true, but some people complain that I am anti Seagate; I am, but for good reasons. As you mention, they have a consistently poor reliability rate, going back over 2 decades. Plus they dont like honouring warranty claims; if you can return it via the seller - great, but if the seller has gone and you try to return it yourself, forget it. They're both USB 3.0, so the line speed will be 5 Gigabits/sec. However, they're also 2.5" spinning disks, so the maximum sustained transfer data rate will not be much over 100 Megabytes/sec. I doubt if there will be much difference between the drives, unless one of them has a higher RPM (e.g. 7200 vs 5400). I worked in the industry for 8 years (not been in it for 3) and it always made me laugh seeing people say brand x is better than brand y even more so when it comes to HDD. I got the 5TB version in the recent sale for a similar price, excellent drive, essentially a WD MyBook with an extra terabyte. Speed is roughly 105mb a sec, doesn't overheat, doesn't lose your view settings and it looks sleek. Sorry, there have been plenty of links to diskfarm results showing Seagate drives are the most unreliable. They have a few decent drives, and others have a few dodgy drives; but overall Seagate drives are the most unreliable, and always have been. 1/ Heavily discounting sales to big system makers and wholesale outlets. 2/ Buying out other (more reliable) manufacturers and shutting them down. In other words, they are the TalkTalk of the HDD world. They must be really happy SSDs are taking over, because even they cant bugger them up the way they do their HDD plants. Sorry, there have been plenty of links to diskfarm results showing Seagate …Sorry, there have been plenty of links to diskfarm results showing Seagate drives are the most unreliable. They have a few decent drives, and others have a few dodgy drives; but overall Seagate drives are the most unreliable, and always have been.They have survived by using two techniques1/ Heavily discounting sales to big system makers and wholesale outlets.2/ Buying out other (more reliable) manufacturers and shutting them down.In other words, they are the TalkTalk of the HDD world.They must be really happy SSDs are taking over, because even they cant bugger them up the way they do their HDD plants. As I said, plenty of links. If Seagate drives are no less reliable than others, how is it that you almost never see any other make of "Recertified" drives for sale, excepting the recent spate of WD drives. Please point me to mass sales of Recertified Toshiba or Hitachi drives.